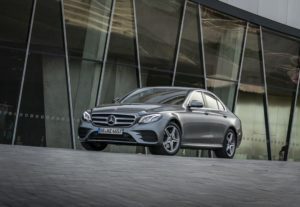 The new Mercedes E 300 e is available to order, with prices starting at £47,450 for the entry-level SE model. Following on from the E 300 de, the E 300 e (saloon only) now completes the E-Class hybrid range. The E 300 e is powered by a turbocharged 2.0-litre petrol engine which produces 208 bhp and 258 ft lb of torque and a hybrid module with 120 bhp of electric power and 325 ft lb of torque (combined system output is 516 ft lb). It can achieve 134.5 mpg on the combined cycle and emits 46 g/km of CO2. It can travel from 0 to 62 mph in 5.7 seconds and has a top speed of 155 mph.